Last year, 13 Maryland schools sent athletes to compete in the inaugural VA Showcase, the indoor-mega with the goal of attracting the best from all around the eastern United States under the roof at Liberty University. This year that number has more than doubled as the meet continues to grow. 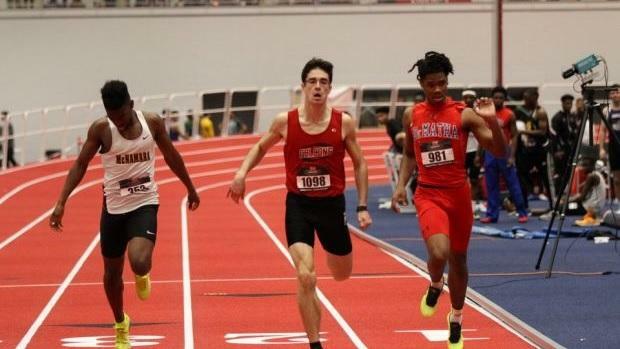 Let's compare the top Maryland boys performances from last year's meet to the top entered Maryland athletes in this year's meet. Bullis' Eric Allen, Jr. set the current MD #1 mark at the Southern Maryland Track Classic two weekends ago. Bullis' Eric Allen, Jr. - the top Maryland performer at the VA Showcase in 2017 - will be back at Liberty University to try and lower his season best (and current MD #1 time) of 6.46. DeMatha's Brendon Stewart (who ranks third in the state at 6.48 seconds) is also entered. Bullis' Ashton Allen - merely a freshman at the time - ran 21.94 at last year's University of Kentucky Invitational and is seeded second at this year's meet. Maryland only saw two athletes crack the silver elite performance standard of 23.00 at last year's inaugural meet, but this year promises to be much different. Bullis alone has four boys seeded well under 23 seconds, including last year's top performer Bryce Watson and sophomore Ashton Allen (seeded second overall at 21.94). Along with athletes from McNamara and DeMatha there are ten Maryland boys seeded at 23.00 or faster. Bullis' Eric Allen, Jr. finished third in the 300 at last year's meet while recording one of the fastest 300 times the state of Maryland has ever seen. Overall the 300 was the deepest event on the boys' side in 2017, with ten total performances that met the silver elite performance standard. Both Allen and DeMatha's Nick Wilson are entered in the AAU Invitational 300 meter dash. One of the top quarter-milers in the state, DeMatha's Nick Wilson dropped a 48.25 performance last spring at the North Capitol Invitational, winning a showdown with Oxon Hill's Aaron Robinson. Two of the four Maryland silver elite performers at last year's VA Showcase came from Bishop McNamara, led by Ellion Trotman at 1:05.91. DeMatha's Nick Wilson (48.53 indoor 400 personal best) is entered in the AAU Invitational 500 meter dash. Last year, McDonogh's Dalton Hengst finished second in the 800 (which was, at the time, the MD #1 mark). Hengst is running the 1000 this year, but Maryland will be well represented in the invitational 800 meter run. Northwest's Chase Osborne is the top seed from the state, along with Oxon Hill's Randy Serville and Calvert's Carter Singletary and Isaiah Willett who could go under two minutes. McNamara's Jeremiah McCain led all Maryland performers in the 1,000 meter run at last year's VA Showcase, but his Maryland meet record likely won't stand for long. McDonogh's Dalton Hengst is entered second overall in the AAU Invitational 1,000 meter run (making his 1,000 meter debut on the track). McDonogh's Dalton Hengst after winning last year's invitational mile at the VA Showcase. Hengst won the mile at last year's VA Showcase in a showdown with Freedom's Waleed Suliman. Along with Westlake's Jay Hall, Hengst is one of two Maryland runners entered in this year's boys invitational mile. Hengst is the top seed in a race that features seven boys seeded under 4:20.00. Hall was the only Maryland boy to compete in the two mile at last year's meet, and hit the silver elite performance standard with a 9:41.96 effort. Hall is one of three Maryland boys entered in the invitational two mile this season, along with SMAC and 2A rival Justin Diehl (Calvert, 9:23.52 outdoor personal best) and Declan Horner (Southern Garrett, 9:27.91 outdoor personal best). Wise's Daniel Whitfield clocked one of the fastest times in recent Maryland state history at the PG County Championships on Thursday evening. No Maryland boys cracked the tough MileSplit silver elite performance standard in the 55 meter hurdles (7.70) at last year's inaugural VA Showcase, but Riverdale Baptist's Daniel Whitfield certainly came close. Whitfield now runs at Henry A. Wise, and is coming off of a MD #1 performance of 7.34 at Thursday's PG County Invitational. Four more Maryland boys are seeded at 8.00 or faster coming into the meet. The Bullis boys nearly pulled out a win on Virginia's home turf at last year's VA Showcase; can they hold on and retake bragging rights at this year's meet? Like the girls' 4x200, the boys' 4x200 at last year's VA Showcase turned into a state border battle between Bullis and Western Branch. They ultimately ran 1:27.17 at the Millrose Games in February, and will be rolling out their 'A' team once again in the invitational 4x200 with ambitions to take revenge on Western Branch - and possibly challenge 1:27.00 on the banked track at Liberty University. The McNamara boys - after putting three boys under the MileSplit silver elite performance standard in the 300 and two in the 500 - came back to drop the top time by a Maryland team at last year's VA Showcase. This year the Wise boys are the lone Maryland representative in the invitational 4x400 and are coming off of a MD #1 performance of 3:26.40 on a flat track at the PG County Championships on Thursday. The Gilman boys finished second at the inaugural VA Showcase, and their 8:02.91 finished as a MD #2 time behind only Oxon Hill. The Paint Branch boys are the only team seeded under 8:30.00 at this year's meet. On top of having a cool last name, Bullis' Derrick Tangelo also had the best performance by Maryland throwers at last year's VA Showcase. This year, McNamara's Harrison Wallace (47'1.50 personal best) is the lone Maryland representative in the invitational section of the event. Maryland will be much more well represented at this year's edition of the VA Showcase, with two of the state's top jumpers - Divinus Mutemba (Northwest, 6'7) and Alex Strong (La Plata, 6'6) - entered in the invitational section. Bullis sophomore Austin Allen finished third in the long jump at last year's VA Showcase, and ended up fourth on the Maryland outdoor leaderboard with a 23'9.75 personal best. With that jump he's seeded third in the invitational section of this year's VA Showcase as the lone Maryland representative. Only one Maryland boy has jumped 23 feet in the event this season. No Maryland athletes are entered in the invitational section of the triple jump at this year's meet, but the state triple jump leaderboard could end up looking much different after this weekend, anyway. Northwest's Divinus Mutemba is the top Maryland seed and one of three boys seeded at 43'7 or above; only four boys in the state have cleared 44 feet so far this season.